Deb's Cup of Tea: That's Alive! The office Christmas party was last night. We go out for dinner at an upscale restaurant. We've been doing this for as long as I have worked for the company. This year's venue was Mortons. This is the kind of place, if you're like me, you drive by and wonder what it's like to eat at. There's nothing on the menu you could ever hope to purchase. I started with a chocolate martini. It was very good. We had appetizers of crab cake, shrimp cocktail and Tuna Tartare. I'm not fond of crab cake so I didn't try that. The shrimp was outstanding as was the tuna. They brought over the cart to explain dinner. Of course Mortons is synonymous with "steak" and they had an abundance of steaks on their cart. They also had fish and one chicken dish. 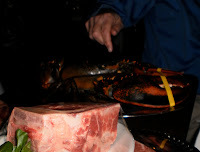 What was very interesting was the lobster sitting on the cart. 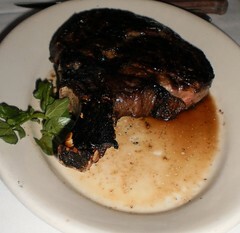 In the foreground you can see what they called a "petite" steak. 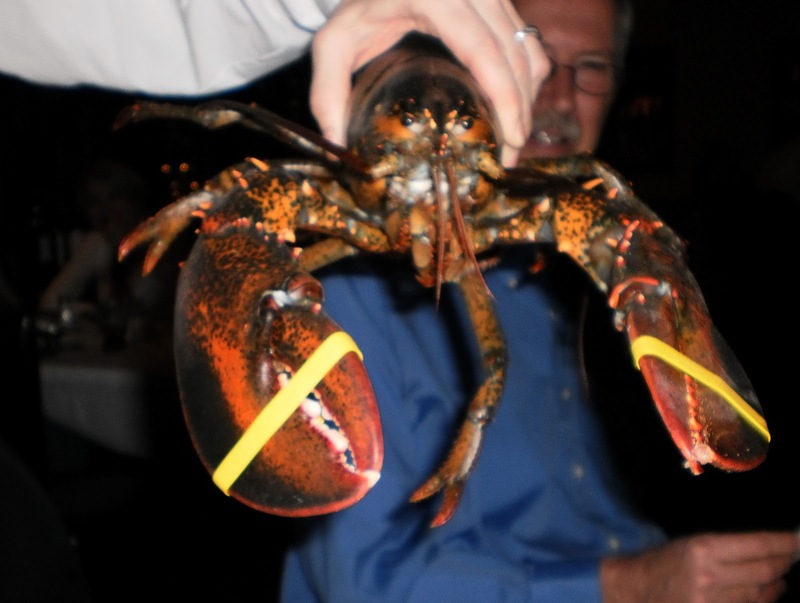 My boss is pointing the lobster. It was just sitting there. The waiter talked about steak and lobster or just lobster. For effect, he picked the thing up. We all, I think, thought it was a very realistic looking plastic model. Imagine our surprise when it MOVED! It was very much alive. There was this lobster waving his various arms at us. So that brings up the "How can I eat this?" feeling. I felt so badly for the lobster. Plucked from the seabed to be paraded about on a platter, picked up and displayed and then tossed in a pot of boiling water. Of course, this discounts the inherent dangers of living in the ocean where he could be some fish's lunch. I've seen them in tanks when you walk into a restaurant, never up close like this. No one ordered lobster. I got salmon. It was good; prepared simply and served in a beurre blanc sauce. We ordered vegetables and split them. I had the steamed broccoli, which was very good. Jon ordered a steak. 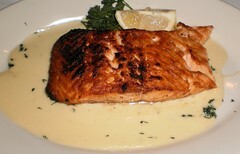 "After all, you don't go to Mortons and order fish," he said, although that's what his fiance and I had. Although it looks charred, it wasn't this dark and he said, echoed by others at the table who ordered steak, that it just melted in your mouth and you almost didn't need a knife to cook it. The evening was topped off with dessert. Oh my, and what a dessert it was. They have 3 "hot" desserts. One was an apple pie and I don't remember the third. 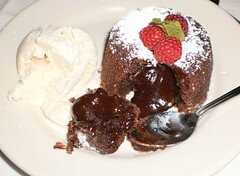 They also have a chocolate cake. You have to order these when you order dinner so I got one. It's chocolate, duh. Presentation was very nice. 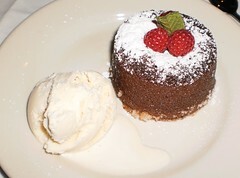 You can see it's a simple chocolate cake, dusted with powdered sugar and topped with a mint leaf and raspberries. It smelled heavenly. The vanilla ice cream must be specially made because it was very vanilla and very smooth. Okay, this is nice, but what makes it so special? I took my spoon and cut into the cake. Out flowed this intensely dark and rich chocolate HOT chocolate sauce. Oh wow. It was incredibly good. Mike ordered cheesecake and his wife ordered one of these. Mike would take some of the chocolate sauce onto his cheesecake. He said the combo was luscious and told our waiter they should think about offering the cheesecake with a berry or this chocolate sauce. So that was this year's dinner. We talk work since that's the link we all have with each other. Jon had just come back from helping our Texas office so he was telling great stories about food and life in eastern Texas, northeast of Houston. We talk about our families. We talk about our plans for next year. We get a "state of the office" speech and we exchange small gifts. It's a very relaxed atmosphere, a chance to dress up a bit and to eat incredible food in a restaurant we probably wouldn't get to experience otherwise. It's also a morale booster. When you've had a rough week, coming to a restaurant and breaking bread makes the reason you thought so and so was a jerk on Thursday seem quite small. Therefore, even when we were very slow, we go out to eat at Christmas. Some traditions are worth keeping. Oh and, for the last 5 years, we've had snow on the day we have the party. We pick the date in October and, invariably, we get snow. That's one tradition we'd just as soon not keep.